Congratulations to all takers of Licensure Examination for Teachers (March 2015) specially to all passers of the said exam. This page was created to help you see your name in the list of passers. Here's the top 10 passers of LET March 2015 in Secondary Level. 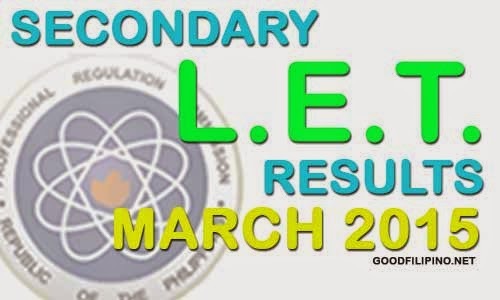 Comments or suggestions about "Top 10 Passers of LET Secondary March 2015 - List of Passers for Teachers (March 2015)" is important to us, you may share it by using the comment box below.